Most often, ureteral obstruction is caused by intraluminal disease (ureteroliths, clots, or other debris in the ureter), less often by intramural disease (stricture, neoplasia, inflammatory disease) and uncommonly by extra-mural (such as retroperitoneal masses or bladder neoplasia). Image: Lateral abdominal radiograph of a cat with the SUB system in place. This cat had bilateral ureteral obstructions and therefore both ureters have been bypassed, so there are three catheters total – one from each kidney to the port, and one from the port to the bladder. There is a needle in place in the port (used for urine collection and flushing the system). Feline ureteral obstruction can be difficult to detect, as no signs might be present until there is bilateral obstruction or unilateral obstruction with reduced contra-lateral kidney function. Often, signs can be very vague such as decreased appetite or abdominal pain. Most of the time, no clinical signs will be recognised by the owners. However, if there is bilateral obstruction, acute kidney injury will develop. In the presentation known as “big kidney-little kidney”, clinical disease can be seen when there was previous ureteral obstruction in one kidney leading to hydronephrosis, followed by end-stage kidney disease (small kidney, irregular and fibrotic) with compensatory hypertrophy on the other side (large kidney). Typically, these cats present acutely when the large (healthy) kidney function is reduced (for example with a new obstruction or development of partial obstruction). The detection rate of renal obstruction or partial obstruction has improved with the advance in abdominal ultrasound imaging in cats, though in some cases a contrast study (after pyelocentesis) is needed to further assess for partial obstruction. Early recognition is key. After 7 days of obstruction renal function is reduced by one third, and after 40 days of obstruction no return of function is expected. In the case of partial obstructions, the development of dysfunction is slower. In terms of decision making, the aim is to make a surgical decision within days in cases with either partial or full obstruction (rather than as an out-of-hours emergency procedure). Although medical management can be attempted, such as the use of diuresis, amitriptyline and prazosin, this is typically not effective, with an estimated overall response of approximately 13%. Surgical intervention with ureterotomy to remove obstructions (+/- stent placement) can be attempted in some cases. A nephrostomy tube can also be placed to decompress the kidney and improve renal function, but is not typically an option for long-term management. 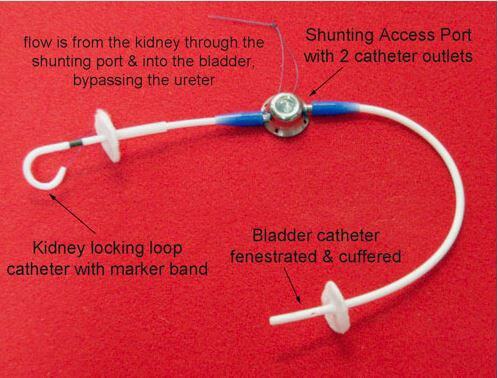 More recently, a subcutaneous ureteral bypass system (SUB) was developed. This involves two separate catheters, one from the renal pelvis to a port placed in the subcutaneous tissue, and the other from the port into the bladder. Urine flows from the kidney to the bladder via the catheters and port, bypassing the ureteral obstruction. Following SUB system placement regular rechecks and ongoing management is required as complications including secondary infections are possible. However, long-term outcomes can be very good, with median survival times of over 2 years reported. At U-Vet, management of feline ureteral obstructions and SUB placement is a collaborative effort, including specialists in diagnostic imaging, surgery, internal medicine, and critical care. 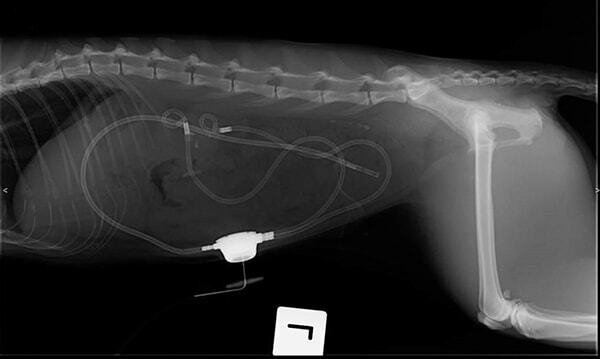 SUB placement is not necessarily the best option for every case of ureteral obstruction, or for every owner, but can be life-saving in many cases.